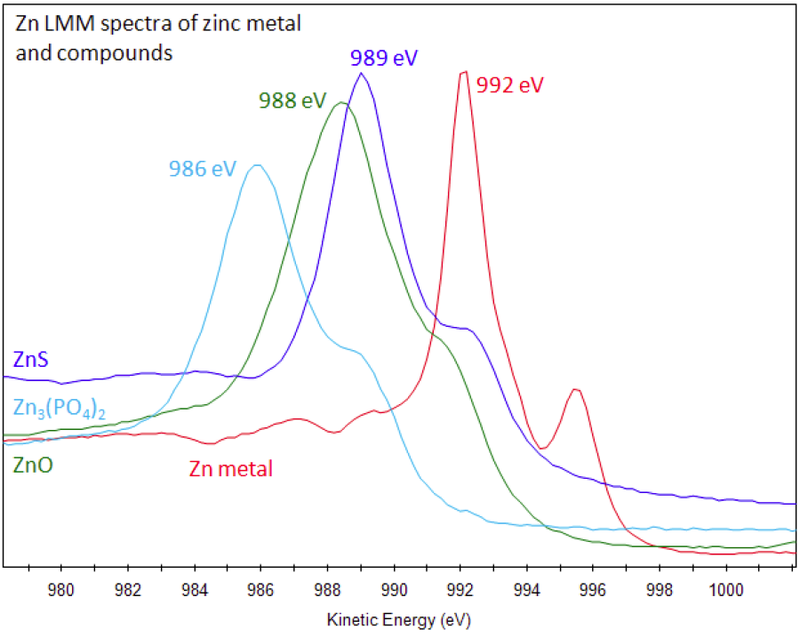 Small binding energy shifts of some compounds compared to zinc metal. Collect principal Zn LMM peak as well as Zn2p. Bigger chemical shifts observed for Zn LMM compared to Zn2p. Zn2p peak has significantly split spin-orbit components (Δmetal=23 eV). 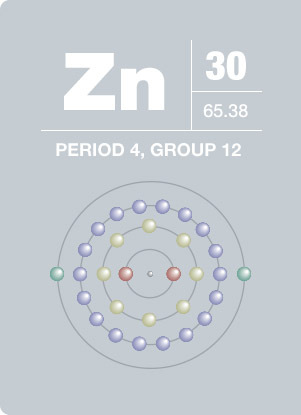 Zinc shows only a small binding energy shift in the Zn2p3/2 region (1021eV-1023e, modal value). Peak width may broaden in the presence of more than one Zn species. Zn2p peaks often accompanied by Auger peak at Kinetic Energy ≈990eV. If zinc is buried (under carbon, for example), Zn Auger peak may be observed even if Zn2p is not (due to difference in electron kinetic energy). Similarly, Zn3p (very high kinetic energy) may be observed even if Zn2p is not. There have been concerns about mobility of zinc in alloys and vapour pressure with concern about introducing zinc into a high vacuum environment. In practice this is not a major concern, if the sample is not heated in vacuum. the growth of plants and animals, and altered biological concentrations of zinc can lead to severe health problems. Zinc’s principle use is to galvanize iron and steel, preventing corrosion. It is also used to form numerous metal alloys such as brass, bronze, and aluminum solder. Zinc oxide is used in plastics, cosmetics, and wallpaper, while zinc sulfide is employed in luminescent dials, TV screens, and fluorescent lights.